The Great International Railway Suspension Bridge. Over the Niagara River connecting the United States and Canada the New York Central and Gt. Western Railways. 24 ¼ x 32" Handsomely double matted, glazed and Dark-wood frame: 34 x 44"
This superlative image depicts the Niagara Falls Suspension Bridge, The Niagara Horseshoe Falls, American Falls, ‘Maid of the Mist’ and Lower Niagara River. It was drawn by Richardt first as a pencil sketch and then painted in oils later engraved by D.L. Glover and published by H.L.Glover 1859. It differs somewhat from a similar image published by Currier & Ives in 1857. Built by Charles Ellet and completed by John A. Roebling (1806-1869) who went on to design New York's Brooklyn Bridge. The first locomotive crossed the bridge in March 1855 at 5mph. 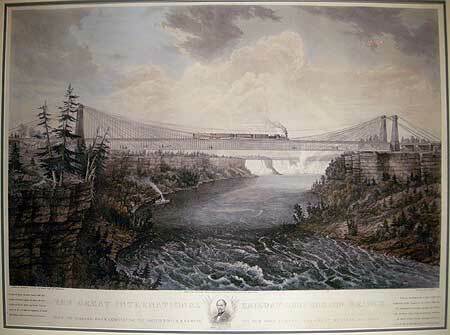 The Niagara Falls Suspension Bridge was the world's first working railway suspension bridge Suspension bridge. The bridge was the first to disprove the assumption that suspension bridges were insufficiently rigid for road traffic, using the wire-rope stays as stiffening. The bridge was reinforced by converting it into a steel arch in 1898. The bridge carried mixed traffic on its two decks across the Niagara River; trains crossed over the river by way of the bridge's upper deck while pedestrians and carriages used the lower, being the result of a collaboration of two companies from two countries.